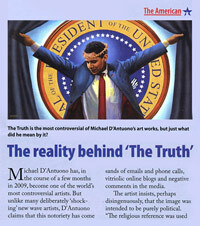 Michael D’Antuono has, in the course of a few months in 2009, become one of the world’s most controversial artists. But unlike many deliberately ‘shocking’ new wave artists, D’Antuono claims that this notoriety has come about by accident rather than design. radio shows. 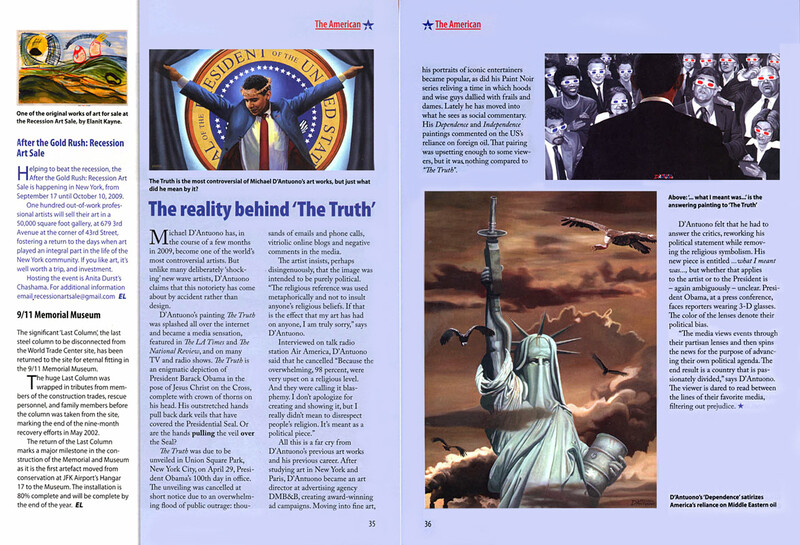 “The Truth” is an enigmatic depiction of President Barack Obama in the pose of Jesus Christ on the cross, complete with crown of thorns on his head. His outstretched hands pull back dark veils that have covered the Presidential Seal. Or are the hands pulling the veil over the Seal? “The Truth” was due to be unveiled in Union Square Park, New York City, on April 29, President Obama’s 100th day in office. The unveiling was cancelled at short notice due to an overwhelming flood of public outrage: thousands of emails and phone calls, vitriolic online blogs and negative comments in the media. The artist insists, perhaps disingenuously, that the image was intended to be purely political. “The religious reference was used metaphorically and not to insult anyone’s religious beliefs. If that is the effect that my art has had on anyone, I am truly sorry,” says D’Antuono. All this is a far cry from D’Antuono’s previous art works and his previous career. After studying art in New York and Paris, D’Antuono became an art director at advertising agency DMB&B, creating award-winning ad campaigns. Moving into fine art, his portraits of iconic entertainers became popular, as did his Paint Noir series reliving a time in which hoods and wise guys dallied with frails and dames. Lately he has moved into what he sees as social commentary. His Dependence and Independence paintings commented on the U.S.’s reliance on foreign oil. That pairing was upsetting enough to some viewers, but it was nothing compared to “The Truth”. D’Antuono felt that he had to answer the critics, reworking his political statement while removing the religious symbolism. His new piece is entitled “…what I meant was…” but whether that applies to the artist or to the President is – again ambiguously – unclear. President Obama, at a press conference, faces reporters wearing 3-D glasses. The color of the lenses denotes their political bias. “The media views events through their partisan lenses and then spins the news for the purpose of advancing their own political agenda. The end result is a country that is passionately divided,” says D’Antuono. The viewer is dared to read between the lines of their favorite media, filtering out prejudice.